The Bounty Bible, printed in 1761, was one of the items removed from HMAV Bounty when the crew of mutineers and Polynesian men and women, under the command of Fletcher Christian, landed at Pitcairn Island and made it their home. The Bounty itself was burned and sunk so that it could not be spotted by a passing ship and give away their location. The last surviving mutineer, John Adams, used the Bounty Bible to teach the Pitcairn Island children, and surviving Polynesian women, to read English, having himself been taught to read from the same book by mutineer Ned Young. After Adams’ death, the Bible was given to an American sailor in 1839, and it eventually ended up being presented to the Connecticut Historical Society in 1896. 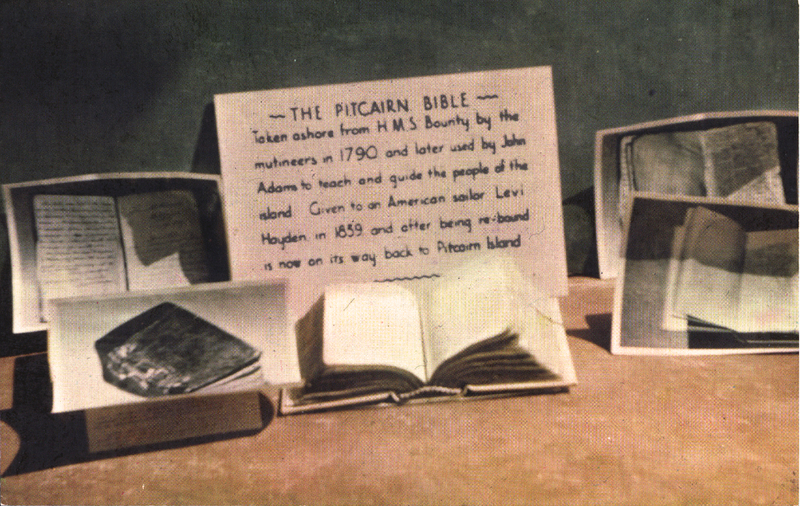 Following a request for the return of the Bible by Pitcairn school teacher A. W. Moverley, the Connecticut Historical Society passed it to Sir Oliver Franks, the British Ambassador in Washington, D.C., in March 1949. It was then restored and rebound in London and the Colonial Office had it transported back to Pitcairn via Fiji, where a wooden case was made for it. Adrian Dobbs, assistant secretary to the High Commissioner for the Western Pacific, was tasked with returning the restored Bible to Pitcairn. It was presented to Pitcairn magistrate Warren C. Christian on 22nd February, 1950, at a public meeting in the Pitcairn Courthouse. He stayed on the Island for a month and compiled a report on the progress of the isolated Pitcairn community of, at that time, 148 people. He left Pitcairn on board the Rangitata when she called at the Island on 19th March, 1950. The Bible is now on display in the museum on Pitcairn. 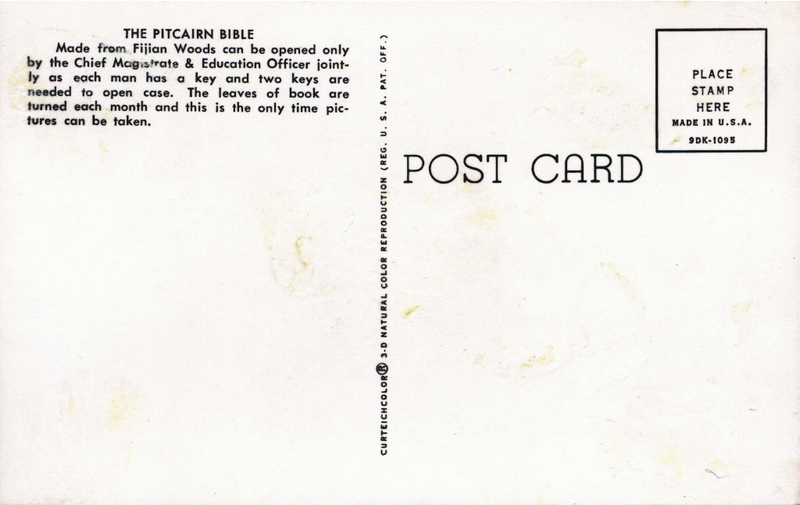 Above: American postcard published by Curteich in 1969 for sale on Pitcairn Island, showing the Bounty Bible.